Add color and style to any boring wardrobe with these fun and playful scarf sets. 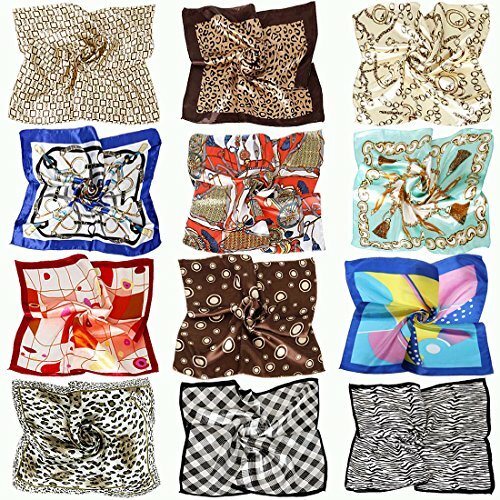 Each pack of scarves comes with 12 different designs and colors to help add variety and accessorize your fashion options. With soft, lightweight, silk like materials, each piece is perfect for the summer or winter to keep you looking cute and chic all year long! You can rock one or try twisting them together to create different looks. Wear these scarves in your hair, wrap it around your head, or tie it around your neck. Attach it to your purse or luggage to easily identify your belongings when traveling. This huge bundle allows you to revamp your closet with your personal style or give a few away for stocking stuffers and party favors. Take your fashion sense to the next level! This pack features 12 designs including plaids, chains, polka dots, and animal prints! *NOTE*: Due to differences between monitor displays, actual color may vary slightly from image. b.m.c is a registered trademark of Remi Collections LLC and is exclusively distributed by Bundle Monster. The b.m.c trademark is protected by US Trademark Law.